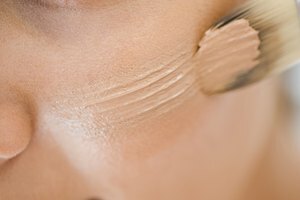 Find your perfect foundation online. 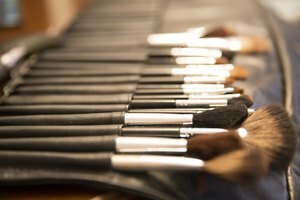 Unless you test a foundation on your face before you buy it, there is always the possibility you may not wind up with a perfect match. Buying online can increase the gamble, as the color on the screen may not be true to the color in the bottle. Take out some of the guesswork by carefully examining the texture, shade and warmth of your skin. If you already own foundation, use it as a reference to help match your ideal shade online. Stand or sit near a window and look at yourself in a mirror. Household lightbulbs can make your skin look more golden than it really is, and harsh florescent lights can give you a pale, greenish cast. 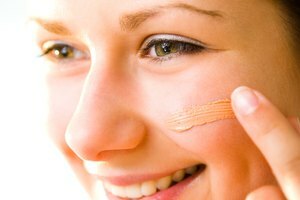 You should always examine your skin in natural light to get the best foundation match. Decide whether your skin is light, medium or dark. Many foundations are shown in a spectrum of shades from very light to dark. Knowing which of these three broad categories you fall under will greatly narrow your range of suitable shades. Hold a piece of white paper up to your face. If your face looks fresh and bright next to the paper, you have cool undertones in your skin. If you’re face looks sallow -- that is, yellowish -- next to the paper, you have warm undertones. Cool skin has more visible pink and red, and the veins in your wrist will look blue or purple. Warm skin is often described as "golden" or "olive," and veins look greenish. If your veins are between blue and green, you have neutral skin. 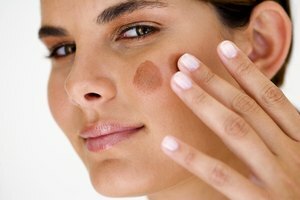 Determine how much coverage you need in your foundation -- that is, if you want your natural skin tone to be very visible, somewhat visible or not visible at all under your makeup. Tinted moisturizers and BB creams have the least coverage, which makes them easier to blend with your skin. Many tinted moisturizers only come in a few shades, such as “light,” “tan” and “deep.” Foundations with more coverage will cover blemishes and discolorations, but it will be more obvious if they don’t match your skin. Choose a foundation brand that indicates undertone and shade -- for example, cool and fair -- in the title or description. Choose according to your shade and level of warmth, in the lightest coverage that’s appropriate for your skin. Pat the foundation on your jawline when it arrives, using a sponge, brush or your clean fingers. Check it in natural light to see if it disappears into your skin. If the difference between your foundation and your skin is obvious, consider purchasing a second shade that’s either one shade lighter or darker. With two slightly different colors, you can blend them together to create your perfect shade. Examine your skin for irritation and redness, flakes, shine and blemishes. 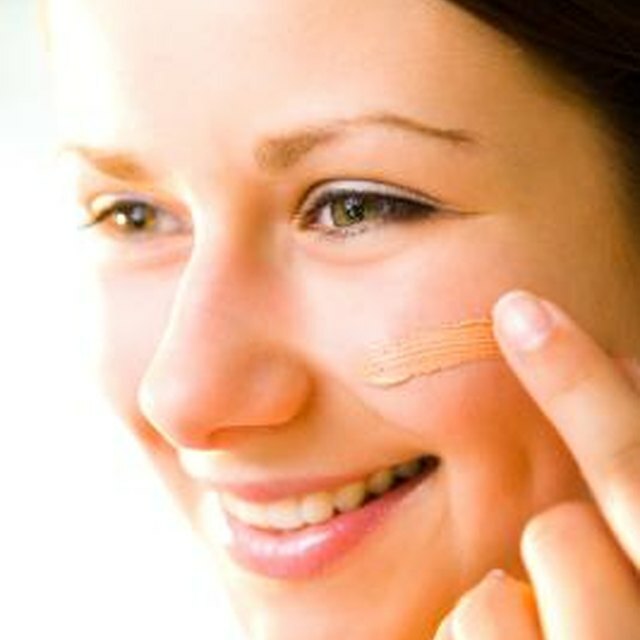 Irritation indicates sensitivity, so look for foundations that say “hypoallergenic” or are specified for sensitive skin. For flaky dry skin, choose a moisture-rich formula. If you have shiny, oily skin, choose oil-free foundation with a matte finish. Check the online provider’s return policy before you buy. Some companies will allow you to return or exchange products, while others will not. Remember that computer screens can distort colors slightly. When in doubt, choose your foundation based on the description, not the color shown. If a new foundation causes burning, itching or irritation, remove it immediately with makeup remover or soap and cool water. What Colors Are Good for Black Women? Robinson, Lindsey. "How to Find Your Foundation Color Online." Synonym, https://classroom.synonym.com/foundation-color-online-20505.html. Accessed 23 April 2019.